There are several things to take into consideration when planning your hike along the Kalalau Trail. From obtaining a camping permit to choosing a water filtration system and cooking your meals – planning appropriately will make for a smooth trip. Clay and I planned our trip in about a month’s time, which worked out wonderfully for our October hike. 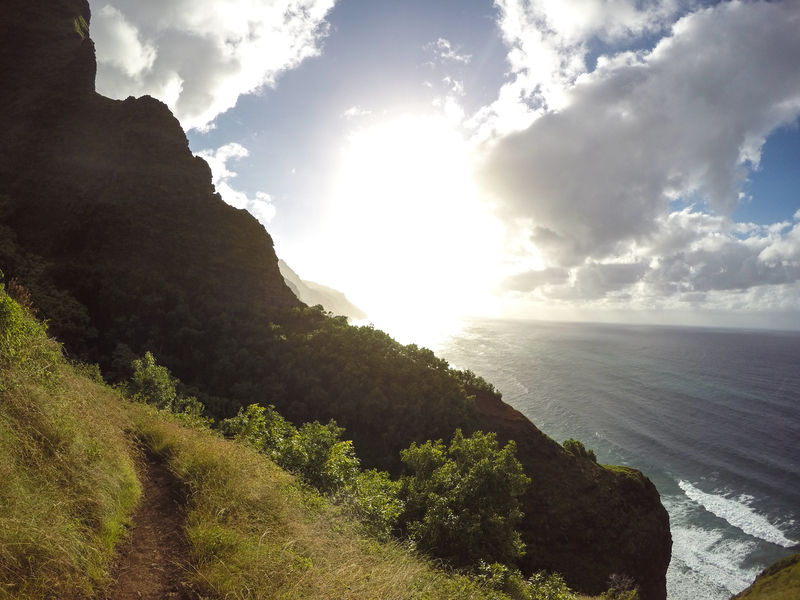 For those of you wanting to hike the Kalalau Trail during the peak of summer, start planning sooner rather than later! Permits can be sold-out for specific dates up to four months in advance. While reading blogs and seeking advice from my friends before our trek provided us with helpful information, here is some information that I would have liked to have known before taking on the Kalalau Trail. Legally, hikers, kayakers, or anyone entering Kalalau is required to obtain a camping permit to access this paradise. This can be found at https://camping.ehawaii.gov. The state of Hawaii issues only 40 permits per day, keeping the occupancy in Kalalau to a minimum. After arriving in Kalalau, I was curious to see just how many hikers had obtained the permit. A majority of the tourists that we met had obtained the permit, however, many local people and returnees to Kalalau were there sans permit. When beginning at the trail head, I had my paperwork handy to show a park ranger, but I was never asked to provide it. After getting to know the Kalalau locals, it seemed that rangers used to consistently check for permits about 3-4 years ago, and since then have stopped. I, being the rule-abider that I am, never once questioned obtaining the permit. I didn’t want to take the chance of being turned away at the trail head, and was happy to contribute to the state and the maintenance of this trail to paradise. The campsites at Kalalau did offer a latrine as well as nice campsites, however I was surprised by the lack of trail maintenance. There are spots along the trail that are treacherous and sketchy – partly by nature, but also in part to erosion and a lack of trail maintenance. I am not suggesting dodging the permit, but rather lowering any expectations of the trail conditions and being happy in contributing to the Hawaii government, even when others may have not. You will definitely need a water filtration system for this hike – especially for the eleven mile hike in to Kalalau. I brought my Katadyn Hiker which did the trick. Other options are iodine or chlorine tablets, as well as boiling water for five minutes. 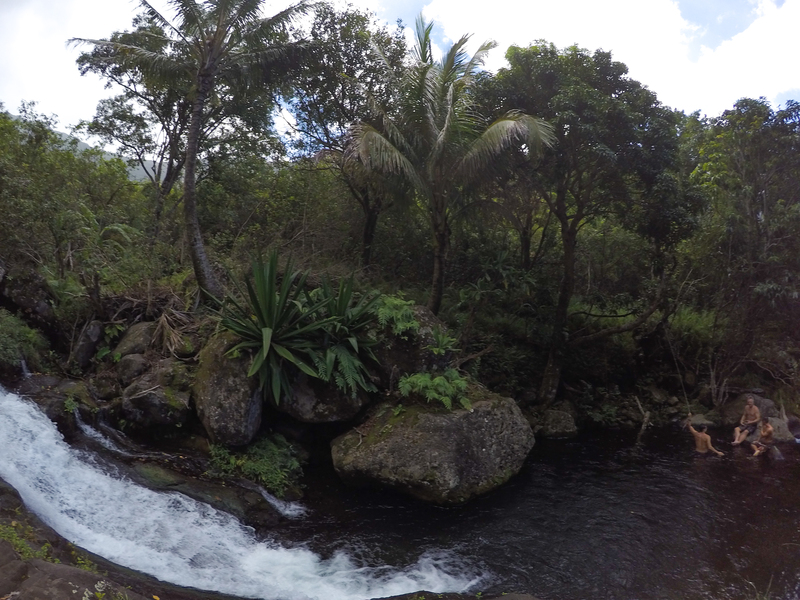 Once you are in Kalalau there is a waterfall that some choose to drink straight from. Clay and I always opted to either boil the water or filter it, but there is no shortage of water along the hike! One of the many water sources. After researching and reading blogs on reaching the trail head from the Lihue airport, I found that a majority of people rented a car for the duration of their hike and left it parked at the trail head. While this seemed expensive and unnecessary, Clay and I opted to try the bus. We had read on the Kauai bus website that over-sized backpacks were prohibited on the bus, but we also had a friend who had been successful in boarding the bus with his pack. Fresh off the plane, Clay and I headed to the airport bus terminal and awaited a shuttle. The bus driver happily let us on and gave us thorough information about which bus we would need to take next to reach Hanalei. The tricky part with riding the bus to the trail head is that the bus route stops 7 miles away from the start of the hike. Clay and I lucked out as we had some Colorado friends with a rental car meeting us in Hanalei. Our plan was to ride to the trail head with our friends, Matt and Isabel, and enjoy a day hike to Hanakapiai Falls together before parting ways. Options to reach the trail head from Hanalei are walking and hitchhiking. As familiar as locals are with hikers and the trail, I would imagine having some luck. As long as you have patience and a little flexibility in your hike, it saves you some money and any worries about a rental car parked at a trail head for five days! On the Hawaii government website, you may notice that it says “no campfires”. Clay and I had heard from friends prior to going that while it was technically prohibited, fires were often made once at Kalalau. This was helpful information to know, as we decided not to bring a camp stove. Some of the campsites at Kalalau have nice, pre-made fire pits, and there is plenty of wood to be found! We did bring lint which was helpful in starting each evening and each morning for cooking. Lastly, I cannot express enough what an amazing place Kalalau is. The place itself and the people you will meet will make it perhaps your most memorable trek yet.